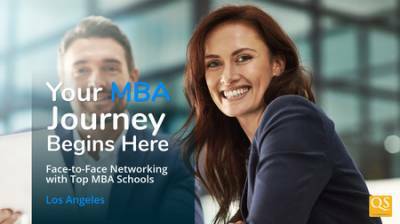 Register now to attend the largest MBA Tour in Los Angeles on Mon., June 24th and meet with several top business schools, all under one roof! Receive all the information you need to explore your MBA options; learn about local schools, explore MBA programs from schools around the US or even the possibility of studying abroad or online. Along with having all your admissions questions answered, you will also receive GMAT test-prep advice, a resume review, take a free headshot, and much more. By attending you'll also gain exclusive access to information about over $7M in scholarships, application fee waivers, and more discounts and offers from QS partners. There are countless benefits to receiving an MBA. From moving up the career ladder to gaining the skills you need to start your own business, an MBA can open many new career doors for you. Don't miss out on this exclusive opportunity, register now and bring a friend too. - You'll also receive a lanyard that will provide access to MBA scholarships worth $7 million!